Abstract: The research is concerned with the local wisdom of Kembar Mayang in wedding tradition of Jawa ethnic. Local wisdom can be in the forms of knowledge, skills and policies used for the welfare of the peoples concerned. Tied to this, Kembar Mayang, about a meter in height, has been known as a pair of symbolic ornaments made from of janur or coconut leaf, trunks of banana tree, fruits and flowers of five colors and usually presented in the wedding tradition of Jawa ethnic. The research is conducted by means of descriptive qualitative method and supported by phenomenological approach. Data collection technique and procedures cover observation, interview, questionnaire and documentation with 20 key informants consisting of community leader, scholars, and community members. The results show that there are four points of local wisdom in Kembar Mayang: Maintaining Family Honor, termed keris-kerisan in the form of dagger-shaped webbing; Mutual Protection, termed payung-payungan in the form of umbrella-shaped webbing; Fidelity, termed manuk-manukan in the form of bird-shaped webbing; Tenacity and Sacrifice, termed walang-walangan, in the form of praying mantis- shaped webbing. Kembar Mayang as a cultural heritage is to be preserved to be used as a guideline in social life. Abstract: This study focuses on Technical and Vocational Education and Training (TVET) includes formal, non-formal and informal learning that prepare young people with the knowledge and skills required in the world of work. English has become an important language in Malaysian higher learning institutions that is used as a medium of interaction and for other educational purposes. For this study, the researcher would like to highlight the impacts of blended learning on students’ writing performance. This is due to the concerns regarding students’ difficulty in English writing. The study used experimental research design to conduct the study that involved 60 students from semester 1 who took Communicative English 1. The study has been conducted on two groups, which were experimental and control group. The students had to answer the questionnaire regarding teacher centred approach (control group) and blended learning approach (experimental group). Also, students do writing test to be correlated with the result from questionnaire. SPSS version 23 that used Kendall’s correlation has become the the tool to analyse the result. The result shows that blended learning has a positive effect to the most students in experimental group. Abstract: This paper is part of a study which addresses the reliability of Foreign Language Anxiety Scale (FLCAS) in Malay version. Researchers find that the reliability of an instrument is closely associated with its validity and an instrument cannot be valid unless it is reliable. However, the reliability of an instrument does not depend on its validity. Therefore, this paper investigates the reliability of the instrument called FLCAS in Malay version. FLCAS is widely used in collecting data relating to language anxiety and perhaps the most reliable and comprehensive tool in language anxiety. This paper objectively measures the reliability of FLCAS by using Cronbach’s Alpha, the most widely used objective measure of reliability. The sampled population involved 302 respondents from the government secondary schools in Putrajaya Federal Territory, Malaysia. The items had been translated into the Malay language and back translated into English. Results show that the internal consistency of Crobanch’s Alpha 0.90. It can be concluded that FLCAS in Malay version is an appropriate instrument to measure the levels of language anxiety among the Malaysian secondary school students who learn English as a second language. Abstract: This Study deals with “The Shift of Acehnese Language in Pulau Kampai Community”.The aims of this research are: (1) to obtain the reasons of language shifting that has happened in Pulau Kampai' (2).to find out what factors that caused shifting of Acehnese language in Pulau Kampai.This research use the qualitative descriptive, The Subject of research is the second generation of Acehnese community in Pulau Kampai. The Researcher found that the shifting pattern of Acehnese language among Acehnese community in Pulau Kampai is bilingual subordinate patterns that exist in the second stage. The Acehnese community (in this case, second generation) still uses Acehnese language predominantly but there are some new words that come from other languages that are used to replace some words in Acehnese.The shifting of Acehnese language happened caused by four factor that interconnected between one and the other. The four factors include (1). Migration (Acehnese community in Pulsu Kampai is a newcomers from the other areas, that are Beurenuen, Sigli, Tamiang and Aceh Timur, (2). Number of the speaker (Acehnese community is minority community, (3) Demographic, (Location of new area), and (4) Economic (a condition that requires Acehnese people to meet or join with other workers)caused a shifting of language. 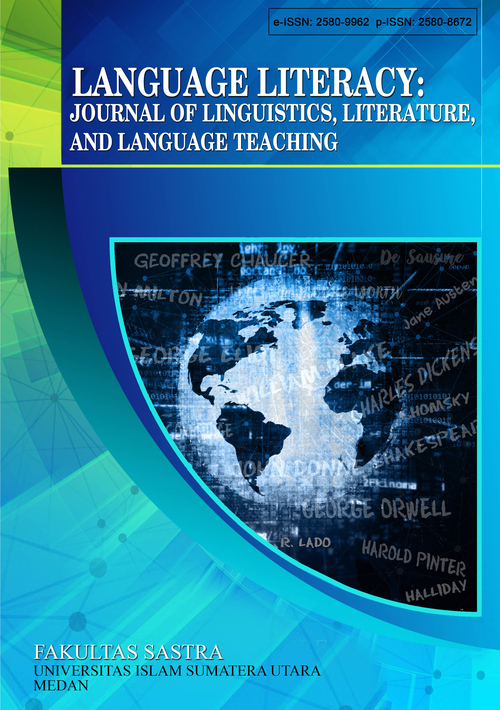 Abstract: ABSTRAKSociolinguistics is a study or discussion of language related to the language Sociolinguistics consists of two elements of the word that is socio and linguistics. Linguistics is the study of language, especially the elements of language (speech, word, sentence) and the relationship between speakers who are part of the members of society.Sociolinguistics places the position of language in relation to its use in society. This means that sociolinguistics views language as primarily a social system and communication system, and is part of a particular society and culture. Hence language and use of language are not observed individually but are always associated with their activities in society.Every human being born into the world is elected into two types, women and men. Gender refers to differences in male and female characters based on cultural construction, relating to the nature of their status, position, and role in society as well as socially-culturally constructed gender differences.In sociolinguistics, language and gender have a very close relationship. There is the phrase "why do women talk differently from men'" In other words, we are concerned with several factors that make women prefer to use standard language compared to men. In this regard, it is worth examining the language as a social part, a deed of value, reflecting the complexity of social networks, politics, culture, and age and society relations.language ideology is ideas and beliefs about what a language is, how it works and how it should work, which are widely accepted in particular communities and which can be shown to be consequential for the way languages are both used and judged in the actual social practice of those communities. In the community of western intellectuals, for instance, one key language ideology is inherited from the tradition of ideas whose major exponents include John Locke (in the Essay Concerning Human Understanding) and Ferdinand de Saussure (in the reconstructed and posthumously published work whose English translation is titled A Course in General Linguistics). In this tradition, signs (or words they are usually treated as being the same thing) stand for ideas, language is the means for conveying those ideas from one mind to another, and the process is underwritten by a sort of social contract, whereby speakers of a given language agree to make the same signs stand for the same ideas. Abstract: This study aim to analyze How to Compare the Cultural Values of a Teenager toward Vernacular Language and Bahasa Indonesia.This study population throughout teenagers around Langsa. Especially in old Langsa sub district, meurandeh village like boys and girls aged around 12-21 years old much as 15 teenagers. Data were collected using a questionnaire for the teenagers. The result of study is teenagers really love and appreciate their vernacular language because vernacular language is mother tounge, teenagers still comsider the vernacular language is very important to know their identity because the vernacular language according to the teenagers can communicate with their environment. Teenagers in area meurandeh Langsa not very active role in preserving the culture of the region because that preserve the regional culture is the parents. If parents do not also preserve the culture of the region then certainly the culture will slowly disappear. So the value of teenagers culture toward local language to communicate with others both in using the vernacular language and Bahasa Indonesia. Abstract: This study aims to analyze how non-marriage couples plan language planning for their daily communicating and language decline for their future children when they are married. The population of this study is all couples dating arround Langsa as many as 10 couples. Data were collected using questionnaires for dating couples. The result of the research is that the coupleshas many good planning to plan the language fir them and their future child, beside that there are still many who want to use local language. Couples dating in the Langsa cuty prefer to plan language planning is the Indonesian language is the mother tongue and for their children will be able to easily communicate with people arround.